Mid Year Sale Starts Now! I'm so excited to announce a new craft workshop! Flowers For Delivery is a miniature craft workshop focused on model hand painting techniques. Give an ordinary looking miniature scooter a complete makeover transformation. Turn it into a french-chic inspired miniature delivery scooter! In this particular piece, there will still be some clay work. 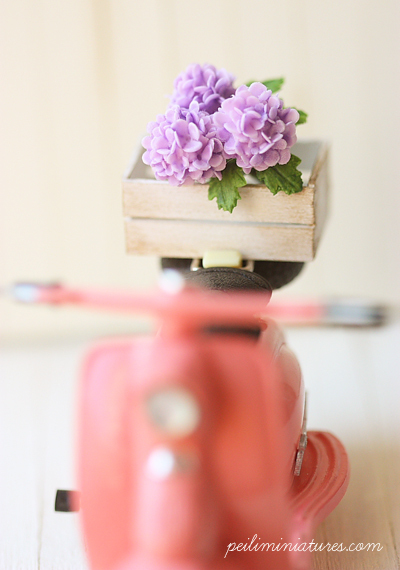 Learn how to make the bouquet of purple hydrangeas to go along with your miniature scooter using air dry clay. The difference between this and the other workshop offerings is, there is painting homework to be completed by the student after class. I've put a lot of thought into planning this workshop, to ensure that learning is maximized in the most effective manner. And the truth also is, hand painting is not difficult once you grasp the techniques, though it is time consuming, the outcome is very beautiful. For the piece to look beautiful, you need several coats of paint to go over your model. Because of this, the painting aspect of it will be completed as a take-home assignment. I will teach you how to handle this paint during class, as it is very different from the paints used in most of the other workshops. We will also review your painting each week when you come for class. For those who love hand painting, you'll enjoy this. I find painting to be both very therapeutic and creative. If you feel the same way, I think you will love it. Also we are talking about detailed painting here. There are many nooks and crannies in this piece, therefore one has to be mindful and focused while painting. Though tedious, I'm sure the polished looking art piece at the end of completion is something you will treasure for a long time. Oh, I've also prepared some notes for the class. This is so that you can refer to the finer tips of hand painting when you are doing it at home. For all my workshop offerings, please see here. I have an exciting news today! I'm holding a mid year sale for selected molds in my shop here! 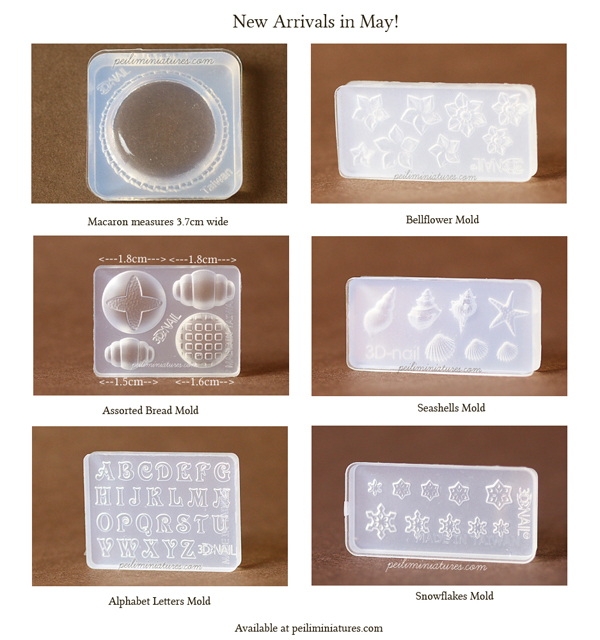 Lots of new molds have arrived in my shop, therefore I've decided to hold a sale! I tried something a little different last week. With a newly made soft violet flower bouquet, I made some white french chic crates to go along with it. I imagined it being display in a shop house front, right at the entrance. It would be pretty stunning! The crates could be used separately in a french chic setting if you wish. I hope you all will have a great week ahead! After my last attempt making some soft violet roses, I turned some into a bouquet. In this flower arrangement, I added tuberose buds and also beige hydrangeas. I am loving this soft colour combination. It's going to its new home! I have another one, in a slightly different colour and style coming up, so look out for it! Soft violet is a colour I've not made many things with. But just the other day, I was in the mood to make some dollhouse miniature roses with this colour, so here I am. I'm not typically a purple fan, but there is something very romantic with this colour. I'm liking it a lot! I was so focused and made quite a few of these. I'm having a couple of them going on sale as single stalk roses over at my Etsy shop here, and then I have some which I made them into a lovely bouquet! I'm so loving the new look, and am hoping to take some photos of them soon!